Setting the pace for progress and innovation . . .
More than a simple survey of the current literature, Advances in Photochemistry offers critical evaluations written by internationally recognized experts. These pioneering scientists offer unique and varied points of view of the existing data. Their articles are challenging as well as provocative and are intended to stimulate discussion, promote further research, and encourage new developments in the field. Douglas C. Neckers is a McMaster Distinguished Research Professor and Executive Director of the Bowling Green State University Center for Photochemical Sciences. He received his PhD from the University of Kansas in 1963, and is the recipient of various awards and honors, including the 1999 InterAmerican Photochemical Society Award for Outstanding Research. His work includes researching and developing new photopolymerization systems and understanding the molecular details of how polymerization occurs after the absorption of light. He has served as Series Editor of Advances in Photochemistry since the publication of Volume 17 in 1992. David H. Volman, professor emeritus, chemistry, was born in 1916 in Los Angeles California. He received his BS and MS degrees in chemistry from UCLA in 1937 and 1938 and his Ph.D. from Stanford University in 1940. In 1940 he joined UC Davis as an instructor and junior chemist but left during World War II to work as research chemist for the U.S. Office of Scientific Research and Development - US-OSRD . In 1946 Volman returned with his new wife, Ruth Jackson, who he had met at Northwestern University during the war to UC Davis as an assistant professor in the Department of Chemistry. He became a full professor in 1956. His academic honors included a Guggenheim Foundation Fellowship, a research fellowship at Harvard University, and a visiting research professorship at the University of Washington. He was a founding member of Sigma Xi chapters at Stanford University in 1939 and UC Davis in 1947. He retained his membership for life. 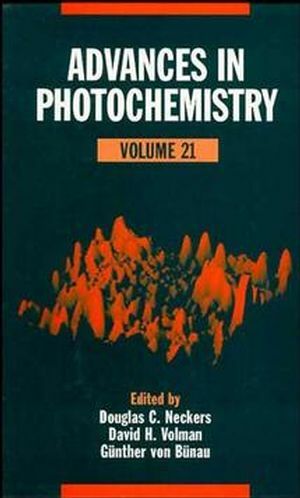 Günther von Bünau is the editor of Advances in Photochemistry, Volume 21, published by Wiley. Photochemistry in Cyclodextrin Cavities (P. Bortolus & S. Monti). Asymmetric Photoreactions of Conjugated Enones and Esters (J-P.
Photodissociation Dynamics of Hydride Molecules: H Atom Photofragment Translational Spectroscopy (M. Ashfold, et al. ).